Alterra is the Dutch research institute for the environment and is an integral part of the Partnership for European Environmental Research. The institute focuses on interdisciplinary collaboration for sustainable development in balance with ecological systems. Michael Singer was selected as a part of a winning architectural team lead by Behnisch and Partner, to provide sculptural interactions with the building’s core environmental systems. 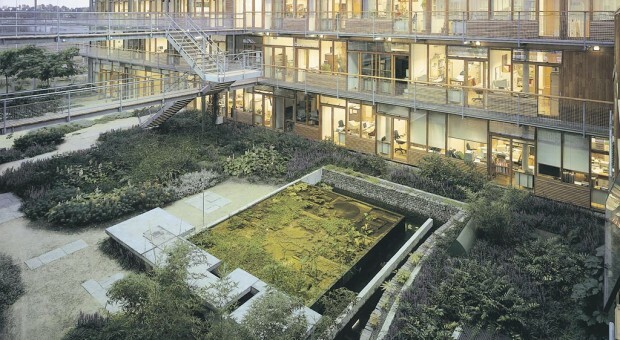 Working closely with the project architecture team, Copijn landscape architects as well as the scientists and researchers that would ultimately occupy the building, Singer developed a series of sculptural spaces within the two core atriums of the building complex. The two atria spaces form the enclosed courtyards of the “E” shaped building and are the principal basis of the building’s innovative energy strategy. The atria allow for natural light to infuse the entire complex and for most offices to have garden access and views. The atria help to moderate temperatures between the interior and exterior of the building. They are utilized for solar heat gain in the winter, reducing heating requirements within adjacent offices and rooms. In combination with sensor activated shading devices, increased ventilation and dense interior vegetation (for shade and evaporative cooling) the atria allow for the building to function comfortably in the summer with no air-conditioning except in the library and kitchen. The sculptural water pools were carefully integrated to combine with this innovative energy strategy, assisting with humidity levels. A Dutch language video on the ‘super glass’ used for the atria gardens can be seen here. The video has several views of the gardens including one of the sculptural trellis shelters.